Read any book about proper magic, not the conjuring trick stuff obviously, and you will find it packed full with astrological symbols, patterns and references. Its odd then that the most famous of all, the Harry Potter series barely gives our oldest science a mention. It is inconceivable that any school of witchcraft and wizardry would not have astrology as a core subject yet Hogwarts doesn’t even have it on the curriculum. How could J K Rowling ignore the most important of all magical subjects ? Well that fact is, she didn’t ignore it, astrology actually underpins the whole story. All of Rowlings characters are astrological archetypes and JK chose their birthdays deliberately. A little known fact about Rowling is that she is an astrologer and this was confirmed when a hand drawn birth chart written by her turned up on the TV programme Antiques Roadshow. All of them, Harry, Ron, Hermione, Snape, Voldemort even Fred and George Weasley and lots of minor characters were given birthdates by Rowling whose birthcharts correspond exactly to their characters and in the case of the major players also to their destinies. So Rowling’s plots unfold from the astrological patterns that these characters manifest. There was no need to make astrology a subject at Hogwarts or to give it a big part in her books because it indirectly permeated the whole thing. In fact its likely that J K Rowling deliberately chose not to write about astrology because it might reveal its true power over the characters and she probably wanted to avoid becoming associated with much of the nonsense that most people believe about this most profound of all sciences. All the best children’s stories have the same themes at heart. The battle between good and evil, heaven and hell, light and dark, summer and winter or to put it simply Leo and Capricorn. The Sun is in Leo from July 23rd to Aug 22nd , the peak of summer and the warmest time of the year – everyone is on holiday and life is wonderful. The noble Leo character is full of the generosity of spirit and energy that comes from this time of year, they have a love of being centre stage and a natural effortless confidence that other signs can only admire and wish they could share. Capricorn however, begins at the winter solstice when the power of the light is at its lowest and the ground is covered with snow, everything is dark and cold. The Capricorn character is austere, emotionally controlled and reserved, it is practical, frugal and pragmatic in its expression. The only things that sustain the sign is Christmas and the hope for a better future with the days gradually getting longer and lighter. It’s important to understand that Capricorn is not some kind of personification of darkness or evil. Capricorn has a precious responsibility. It is the sign entrusted with the light of life when it’s at its weakest and this light has to be sheltered and protected from the winter storms and the cold during the long journey through to spring. The vast majority of Capricorns carry with them their own personal version of this responsibility. If they neglect their responsibilities however, we are left with only darkness. C.S. Lewis was fascinated by astrology. It is widely accepted that his work has a strong Christian influence and message but the astrological one is far more obvious. The two great powers in the Lion, the Witch and the Wardrobe are Aslan the Lion ( obviously Leo ) and the White Witch ( Capricorn ). The White Witch has gone against the natural order of things by keeping Narnia in a state of permanent winter without allowing Christmas to be celebrated. Capricorn without Christmas and the hope of the slow progression of the light towards Spring and Summer has neglected its responsibilities and has become frozen in a state of darkness. The Capricorn who seeks personal power alone without concern for the responsibility that this power brings is truly capable of evil. The whole book is centred around this simple astrological image. The Christian symbolism is there too but it cannot be separated from the astrological. Some people have observed that all religion is based on astrology but of course some people have been burnt at the stake for their observations so purely from an ecological desire to save wood, Capricorn Research couldn’t possibly comment. The central theme of Harry Potter is the same as that of C S Lewis – the battle between the forces of good and evil, light and dark, Leo and Capricorn. J K Rowling recognised this by giving actual birthdates to the two main protagonists. Harry Potter was a Leo, his birthday was July 31st. Lord Voldemort aka Tom Riddle was Capricorn ( Dec 31st ). In fact Rowling gave us far more astrological information than that but it’s hidden away in the books. Many of the characters birthdays are mentioned but there are two definite birthdates from the tombstones of Harry’s parents, James and Lily Potter. From these and little snippets like the 500th birthday of the Hogwarts ghost, Nearly Headless Nick in 1992, Harry Potter fans have managed to work out birthdays and years for most of the leading characters. As the fans have done so much on their own it’s only fair that Capricorn Research should come up with the appropriate birthtimes where possible. Harry Potter was born July 31st 1980 with a suggested time of 3.00 pm. Harry is obviously the hero of the stories but his character also has the nobility, self assuredness and generosity of spirit that comes with the Sun in Leo. Leos are leaders but they also have a simple, innocent and natural way about them as if they are born to lead. This chart places his Sun in the 9th house. The 9th is concerned with wisdom and understanding, it is about philosophy, religion and higher education as opposed to the 3rd house which is all about the accumulation and communication of information which we Muggles often mistake for real knowledge. So what better placing for the star student and ultimate saviour of Hogwarts than the Sun in Leo in the 9th house ? Harry Potters life experience was of incredible highs but also deep lows and profound losses. The only sign capable of containing this spectrum of experience would be Scorpio and for that reason the timing of his chart is set to give him that sign rising. For many people with a Scorpio Ascendant, life can resemble a battlefield and that was certainly the case for Harry. He also has Uranus rising. The essential thing about Uranus is that it is different. People with Uranus rising think and act in an unorthodox manner. They are usually rebellious and unconventional but are often inspired and have powerful intuitive gifts. They have a way of thinking laterally that enables them to see solutions that others would miss. They can often be seen as being touched by genius. The greatest young wizard of the age would have to have Uranus rising in Scorpio. Jupiter is at the top of the chart, conjunct the Midheaven. Jupiter is the most beneficial planet and this placing is the clearest single indicator of success in a chosen career. For Harry Potter it underlines the nobility of his cause and the dignity with which he pursued it but it also shows the ultimate victory. Harry had an extremely tough life being forced to respond to a level of challenge that would be way beyond what any of us mortals could cope with. This is indicated by a Grand Cross in Mutable signs. A Grand Cross is the most difficult planetary pattern because it is made up of 4 planets all pulling in opposite directions. This pull creates a tremendous amount of tension in the person’s life and forces them into activity in order to try and resolve the conflicts between the planets. With a Grand Cross, the individual is forced to meet the challenges of life head on, there is no way of avoiding them. The was certainly Harry’s karma. Harry’s Grand Cross is centred around the opposition between his Moon in Pisces and Saturn. Pisces is a sensitive, feeling Water sign. It is the last sign of the Zodiac cycle and as such can understand and empathise with everyone because it sees all the collective experience of the 11 signs that have gone before. It’s job at the end of the cycle is to absorb all this experience and to let go of it, releasing it so that a new cycle can begin in Aries. The Moon in Pisces is the most sensitive single symbol in astrology and this placing usually creates a compassionate person who devotes a lot of their time to helping others. It’s a position that can often require a sacrifice of the self to the service of other people. Saturn is the planet of loss and restriction. When in difficult aspect it brings much suffering but it forces the person to develop a powerful inner strength in order to cope with this loss. Harry’s life began with the greatest loss imaginable. Both his parents were killed and his mother, Lily, died making the ultimate sacrifice, giving her own life for that of her baby son. The Moon rules the mother and it is in the 4th house of family. 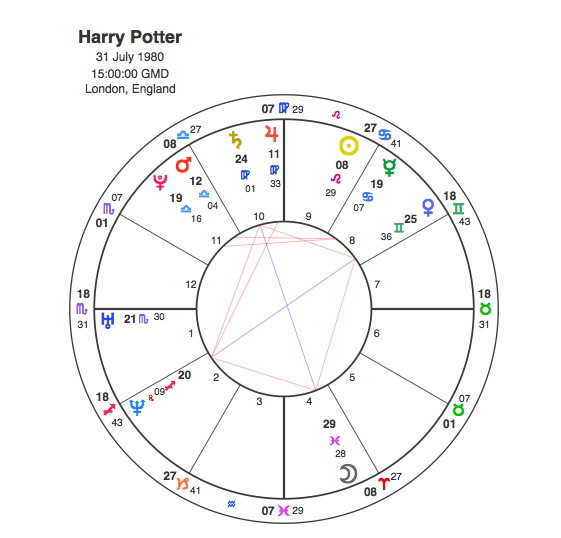 Lily Potter also had the Moon in Pisces so Harry’s Moon in that sign in the 4th house opposite Saturn is obviously referring to her sacrifice as well as Harry’s own destiny of constantly having to risk his own life to protect the whole wizarding community. Harry’s nemesis and the murderer of his mother was of course Lord Voldemort. The Dark Lord in the guise of Tom Riddle was born late in the evening on New Year’s Eve 1926. Voldemort was of course a Capricorn ruled by Saturn, the planet that caused so much trouble in Harry’s chart. The chart has been drawn for 11.00 pm. Voldemort’s Sun is at the base of the chart in the 4th house. The 4th rules the past and one’s psychological connections with it. It governs our deepest motivations and habit patterns that we have inherited or are formed in childhood. With the Sun in Capricorn in the 4th house there would be a strong emphasis on traditional ways of doing things and a reluctance to accept newcomers. So this placing is already indicating the Dark Lord’s insistence on pure breeding in the wizard world and this points to his desire to be rid of Muggle borns. The Moon is in exact conjunction with Saturn, an extremely cold and suppressive aspect. This aspect indicates difficulty with emotional expression and is one of the most common aspects in the charts of serial killers. 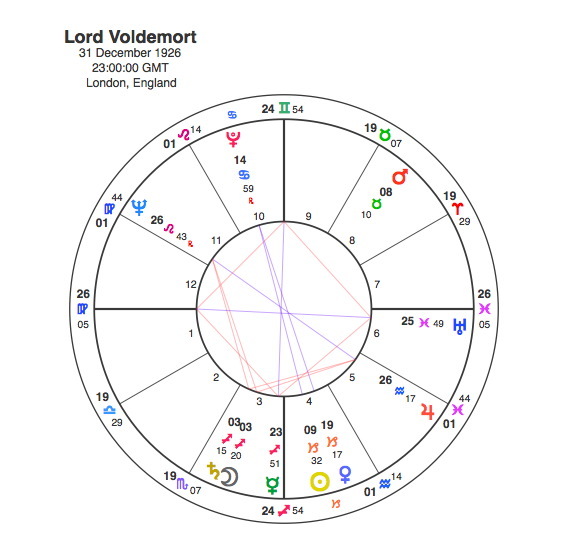 It’s fascinating that both Harry Potter and Lord Voldemort have powerful Moon / Saturn aspects. There are so many references in the books that these two greatest of enemies are also tied to the same energy and fate by the murder of Harry’s mother. Something of their essence combined as Voldemort’s wand made the scar on Harry’s forehead. When the Moon is opposite Saturn as in Harry’s case the troubles and difficulties come from an external source in other people. When the Moon is conjunct Saturn as in Voldemort’s chart, the problems come from within the person. Voldemort’s Sun in Capricorn in the 4th with the Moon conjunct Saturn would point to a character that would not be averse to a spot of ethnic cleansing. The Sun’s aspects really complete the character however. Voldemort’s Sun is opposite Pluto, an aspect that gives tremendous physical and psychological power. It is a particularly explosive energy and can easily be very destructive unless carefully controlled. It gives the ability to manipulate and use other people’s energies and it’s very important that people with this aspect don’t use this energy exclusively for their own ends. Unfortunately that is exactly what the Dark Lord is about. Whenever two planets are in opposition the tension created by the pair would be projected onto any planets that are in aspect to both of them. In Voldemort’s chart, the opposition between the Sun and Pluto is aspected by trine and sextile to Mars. This pattern is called an Easy Opposition and it shows that the tension endemic in the aspect would naturally find resolution through Mars. Mars, the fighter is in the 8th house of death. So the simple fact of all this is that Lord Voldemort deals with his inner anguish by going round killing everyone. A comparison between the charts of these sworn enemies is very revealing. Voldemort’s Ascendant is closely conjunct Harry’s Saturn so the Dark Lord is the personification of all Harry’s troubles. In a chart of someone like Voldemort the 7th house would rule his enemy. He has Uranus on the cusp of the 7th. Harry has Uranus rising. So for Voldemort, Uranus and the final degrees of Pisces ( the 7th house cusp ) is the enemy. Harry not only had Uranus rising but also the Moon at 29 Pisces. So Voldemort’s mortal enemy is personified by Harry. For the other characters in the stories noon charts will be used. Lily Potter’s chart is extraordinary and her fate at the hands of Voldemort is clearly indicated. Lilly had the Sun in Aquarius opposite Uranus. She was certainly unusual with a bright and clear disposition and a skilled wizard to boot. Uranus rules sudden, unexpected events and her life was probably full of them but was certainly ended by one. 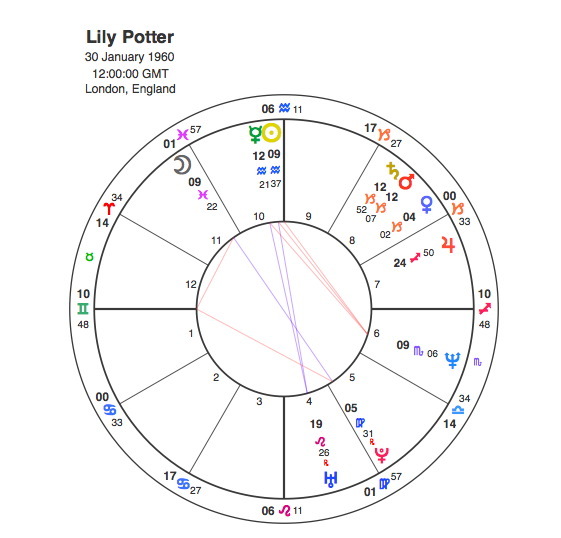 Lily’s Sun at 9 degrees Aquarius is exactly opposite Harry’s Sun so her Sun / Uranus event is inexorably linked to Harry’s life. As her Sun is opposite Harry’s Sun it’s as if his life suddenly takes something away from hers. Harry’s Moon is in Pisces opposite Saturn ( Voldemort ). Lily also has the Moon in Pisces but for her Voldemort represents more than just her mortal enemy, he is her murderer. So Lily has the Moon in Pisces opposite Pluto. Remember Voldemort has the Sun opposite Pluto so we have a powerful symbolic link between him and Lily Potter. The Moon in Pisces opposite Pluto causes Lily to make a sacrifice of her own life. Pluto is in the 5th house of children so she gives up her life to save her son. Voldemort has an Easy Opposition from his Sun / Pluto to Mars in the 8th house. Lily also has an Easy Opposition from her Moon / Pluto to Mars in the 8th house. But Lily’s Mars is exactly conjunct Saturn. So while Voldemort’s Mars is free to go round exterminating all and sundry, Lily’s Mars is stifled by the conjunction to the repressive Saturn. So Voldemort is Lily’s killer and she is his victim. The symbolic connections between all three charts are so powerful it’s no wonder Voldemort’s murder of Lily marked the beginning of the best selling book series in history. James Potter was an only child of older parents who pampered him a great deal, so he grew to be arrogant, boastful, and proud, but deep down a good person. Though more mischievous than diligent, James was a very clever student. An exceptional Quidditch player, James was entirely aware of his talent. He was something of an obnoxious youth for the majority of his time at school, he liked to show off and was exceptionally self-confident.James spent the majority of his academic career chasing after Lily Evans but she was completely unimpressed at first considering him arrogant and obnoxious. As James grew older he matured and they fell in love and married. James Potter had the Sun and Moon in Aries, the perfect combination to describe the above character. Aries always has a strong self confidence which asserts itself quickly and directly. It can easily be seen as arrogance, but it’s really just a singular irrepressible energy that cannot be contained. James’ Venus is in Pisces conjunct Lily’s Moon so she is obviously the love of his life. His Venus is opposite Pluto however, ensuring his love would met a horrible end. 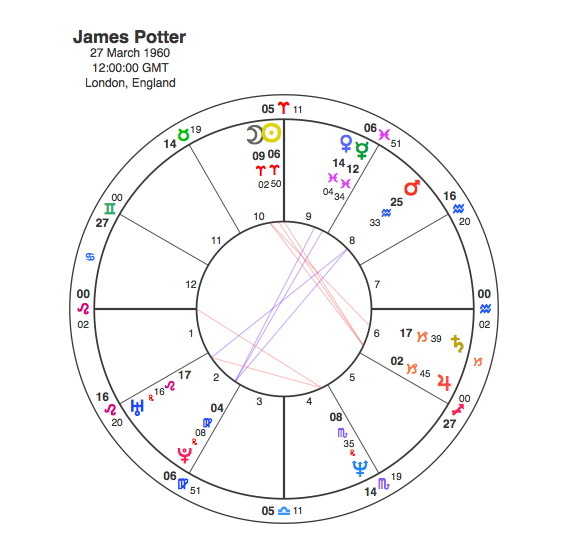 There is also a strong connection between James and Voldemort’s charts. James Sun and Moon in Aries form the apex of a T Square including Voldemort’s Sun / Pluto opposition. So James takes all the Dark Lord’s venom. James also has Mars in the 8th house and this is opposite both Pluto and Uranus showing a horrible sudden death. Severus Snape has the Sun conjunct Saturn in Capricorn so we can immediately see how he was drawn to the Death Eaters. The Sun / Saturn in Capricorn would create a very serious and rather withdrawn personality. 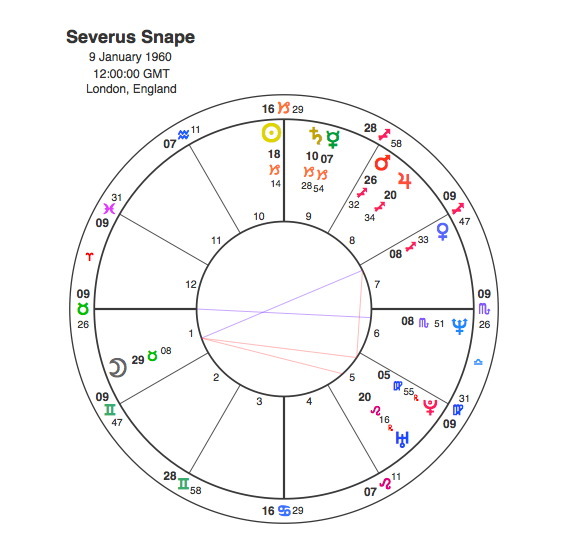 Snape’s Sun is in square aspect to James’ Sun and Moon showing the intense rivalry between them but his Sun / Saturn conjunction made it clear that Snape would always come off worst. Saturn conjunct the Sun has a strongly restraining effect and as a rule, people with this aspect do not receive the things that they really want. Saturn’s role is always to teach acceptance and self discipline but it’s mode of action is often through denying the person’s needs. The Moon in a chart usually points to an individual’s needs. Snape had a T Square based on an opposition between the Moon at the end of Taurus and Venus in Sagittarius in the 7th house. Venus in the 7th would indicate the dream partner but because the Moon is in opposition, Snape would never be able to realise his love. This opposition focuses by T Square onto an apex Pluto which simply indicates that the object of his affections would be killed. Snape of course was in love with Lily Potter, he lost her, first to his rival James and finally when she was murdered. To show that Lily was the object of Snape’s affections, her Moon created a Grand Cross to Snape’s T Square, in square to both his Moon and Venus. The loss of Lily was the cause of all the misery in Snape’s life. Lily’s death however saved Snape from a life as a Death Eater and he chose to join the Order of the Phoenix becoming a force for good but he managed to keep a cover as a kind of double agent. Voldemort and the Death Eaters believed him to be one of them. Snape later participated in the Battle of Hogwarts, but was killed by Lord Voldemort who mistakenly believed that Snape was the master of the Elder Wand, an immensely strong and powerful wand that Voldemort deeply desired. Snape, like James, Lily and Voldemort himself had Mars in the 8th house and all of them met a horrible end. Remus Lupin was a close friend of James Potter and a member of the Order of the Phoenix. He was also a werewolf, a fact that he kept secret from all of the students at Hogwarts although James and Sirius found out and took their own animal identities to keep him company at Full Moons. If any sign has a shifting sense of its own identity, it has to be Pisces and Lupin has the Sun there. He also has an opposition that shows his monthly transformation. This obviously has to involve the Moon and it is closely conjunct Uranus ( sudden change ) in opposition to Mars in the 8th house of personal transformation. Mars rules the animal side of ourselves, so this opposition is the astrological description of a werewolf. Pisceans can be quite secretive anyway owing to their sensitivity and the need to retreat at times to allow the many impressions to settle. 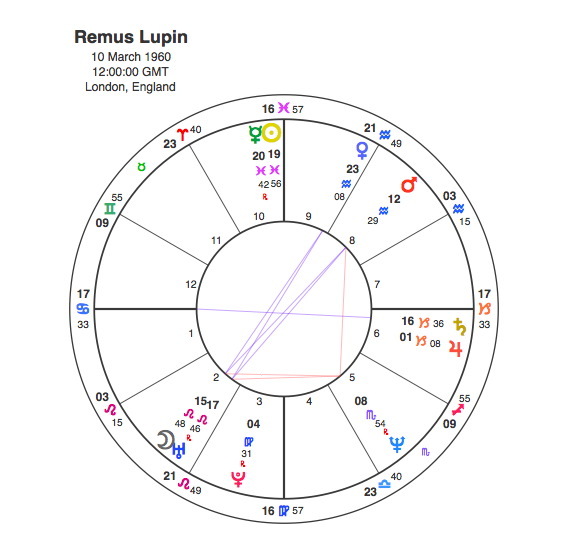 In Lupin’s case his life depended on keeping his condition away from other people and his Moon / Uranus / Mars opposition focused by T Square onto the deceptive Neptune in the secretive Scorpio. It’s very important that readers don’t worry about any similar aspects in their own chart. Harry Potter is obviously a story so the symbols take on a level of dramatic intensity that would be less potent in real life. If you have the Moon conjunct Uranus opposite Mars in the 8th you don’t have to start looking in the mirror for extra hair growth on the Full Moon. If you have the Moon in Pisces opposite Pluto it probably means that you’ll have a difficult time emotionally and go through many big changes in your life but its unlikely you’ll be viciously murdered at the age of 21 by the world’s most dangerous wizard. Remus was killed in the Battle of Hogwarts by Death Eater Antonin Dolohov. Oh and would you believe he also had a badly aspected Mars in the 8th house. What about Hermione ? She was obviously a very particular type of character possessing a brilliant academic mind. She was studious, unfriendly and a know-it-all at the start of the first book. She soon proved to be the best in all her classes, eager to please the professors and to help others learn, albeit in a bossy way that made it difficult for her to make friends. As a diligent student and a perfectionist the obvious sign for Hermione would have to be Virgo. 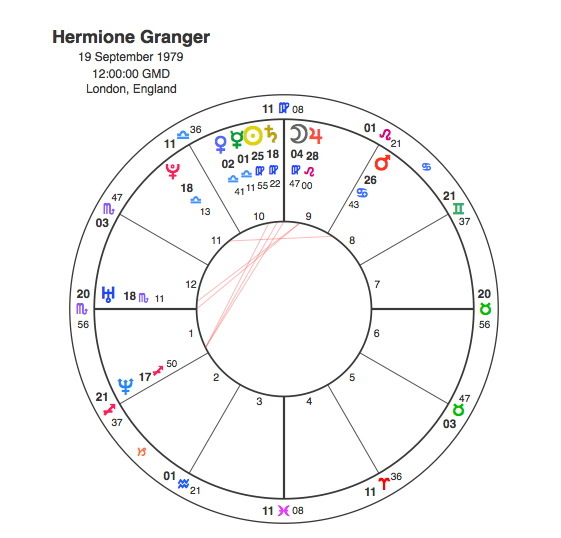 Hermione has the Sun and Moon in Virgo and just to cap it all she has the Sun conjunct serious Saturn. She had a toughness of spirit that comes from Scorpio rising and young women all over the world identified strongly with this powerful combination of brain and courage that constantly got the better of her male counterparts at Hogwarts. Hermione’s Ascendant and Uranus are exactly conjunct Harry’s same combination so her wizarding skills were comparable. Ron was an interesting choice as Harry’s sidekick, much of the comedic quality comes from his character. He was the most mediocre of his siblings, being neither an excellent Quidditch player or decent student, nor the daughter his mother always wanted. Ron was very sensitive about his family’s poverty, and frequently embarrassed by them. All of these factors have combined to cause Ron serious insecurities, an inferiority complex is the main thrust of his character. Ron was quite a moody person who liked to do things the easy way, as he did not like to work hard. There is also a certain vagueness about his character. In many ways he was the polar opposite of Hermione and its no surprise to find his Sun in Virgo’s opposite sign, Pisces. Pisces is the sign with the least sense of self. As the last sign of the Zodiac it contains aspects of all of them and it is often hard for a Piscean to have a clear sense of who they are or what direction they are meant to head in. They seem to flow through life like water often taking the path of least resistance. Insecurity goes with the sign because there is nowhere to stay still and no particular shape that stays with them for long. Many of Ron’s insecurities are felt because he was not one particular thing or another. Hermione, Ron and Harry were on the face of it an unlikely group of friends. They were all so different in character but were in fact archetypes of Mercury, Venus and Mars. These planets represent thought, feeling and action. They are seen in many stories. In Star Trek they correspond to Spock, Bones and Jim. In the Wizard of Oz the triumvirate is there in the Scarecrow, the Tin Man and the Cowardly Lion but in that story the characters have to grow into their Mercury, Venus and Mars. Hermione as Virgo the thinker, Ron as Pisces the feeler and Harry as Leo the action man all fit neatly into this classical story telling pattern. The thing that brings them together is their Sun / Moon connections. A classic link between couples in astrology is where the Sun of one person is in the same sign as the Moon of the other. It means the needs ( Moon ) of one are met and supported by the being ( Sun ) of the other. Harry and Ron’s Sun signs ( Leo and Pisces ) could hardly be more different but Harry has the Moon in Pisces so he needs Ron ( Sun / Pisces ) to compliment him as his mate and sidekick. In the same way Ron needs Hermione. 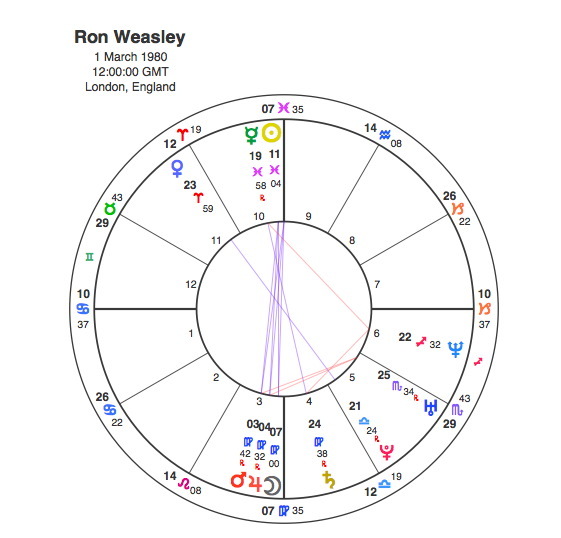 Their Sun signs are again utterly different, even opposites ( Pisces / Virgo ) yet Ron has the Moon in Virgo in the same sign as Hermione’s Sun. His Moon is also conjunct her Moon. This is a very strong indication of two people who were meant for each other and of course they eventually get together and are married. Ron, however has the Sun in Pisces opposite his Virgo Moon so he doesn’t see the inevitability of their relationship for a long time. At the beginning of the series he is quite negative about Hermione and doesn’t appreciate her know – it – all qualities. Ron however, has a conjunction of the Moon with Mars and Jupiter and it is in fact his friendship with Hermione that brings out his courage and confidence. Another astrological link is with the 4 houses of Hogwarts. They each correspond to the 4 Elements of Fire, Earth, Air and Water but particularly the Fixed signs of those Elements. Gryffindor is Leo ( Fire ), Hufflepuff is Taurus ( Earth ), Ravenclaw is Aquarius ( Air ) and Slytherin is Scorpio ( Water ). It’s interesting that although Harry, Ron and Hermione are all sorted into Gryffindor there seems to be some doubt in each case. Harry of course has the Sun in Leo but with Scorpio rising, the sorting hat had to ponder for some time and was tempted to send him to Slytherin. Hermione’s place surprised many as it was thought she would be more at home in the academic Ravenclaw. Ron despite having no major significators in Fire signs was probably sent to Gryffindor because it was a family tradition. All his older brothers were Fire signs, Bill and Charlie were Sagittarius, Percy was Leo and Fred and George were Aries. Of all the major players, the one chart that is missing here is that of Albus Dumbledore. The only details that we have are July or August 1881. After much study of all the possibilities Capricorn Research would like to offer the following as Dumbledore’s chart. All the preceding evidence shows us that J K Rowling handpicked her characters birthdates based on her understanding of astrology. We also know that she stuck closely to astrological archetypes for the main characters. So for the greatest wizard of all it would have to be the Sun in dignity in Leo at the Midheaven. Another important factor was that he was Headmaster of Hogwarts and despite being the most powerful wizard he was a benign, fatherly figure for his students. Hogwarts we know is a 9th house institution of higher learning so what better than to have the Moon in the protective and paternal Cancer in the 9th conjunct Venus. Like Harry Potter, Dumbledore had the Sun Leo, Ascendant Scorpio combination and he was certainly as fearless as his young protege. Dumbledore also had a great many enemies as his powerful 7th house testifies with Pluto, Jupiter, Neptune and Saturn there. Some of these enemies would be senior members of the Ministry of Magic as indicated by Pluto’s conjunction with Jupiter, but the chief one would be the planet that directly opposed his Ascendant. Saturn as we know is the ruler of Voldemort’s Sun sign Capricorn. 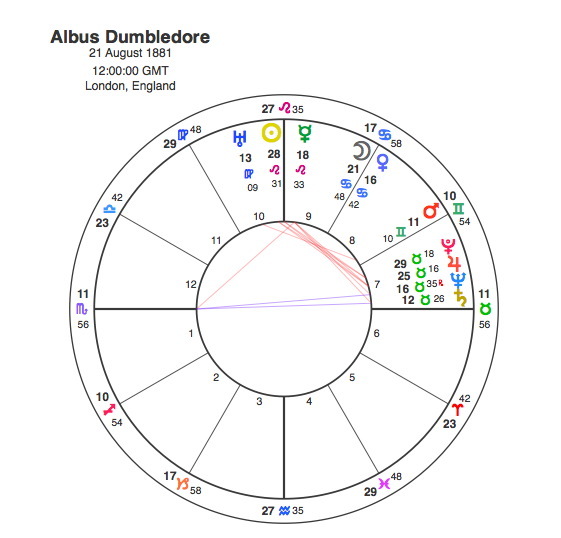 Saturn in both Harry and Dumbledore’s charts represents the Dark Lord. So there we have it, J K Rowling has created a masterpiece which is rightly the highest selling book and film series of all time. Why has it been so successful ? Rowling’s writing and plot lines are masterful and no doubt inspired by the genius of her own Leo Sun with Moon / Uranus / Pluto conjunction in Virgo in the 3rd house. But ultimately, the Harry Potter stories tap into something deep inside us all, an unconscious understanding of astrological archetypes and their meaning for our lives. J K Rowling used her astrological knowledge to add depth to her characters and their impact on the collective psyche of mankind was magnificent. Who should have the final word ? It has to be Pluto. The Harry Potter series is fundamentally about the battle between the forces of light and dark as represented by the Sun signs when those qualities are highest in Leo and lowest in Capricorn. It is also fundamentally about karma. In the end the forces of darkness have to lose. Lord Voldemort’s Sun / Pluto opposition is a powerfully karmic energy. It’s extremely important that this energy is channelled constructively or, as we all know, it can and will wreak absolute havoc. Voldemort abandoned his Capricorn responsibilities to protect the dying light and chose a mission that was self serving and violently destructive. Regular readers of these pages will know that the transit of Pluto to the Sun is the major turning point of a life but if that person was born with Pluto opposite the Sun, the transit by conjunction becomes extremely powerful. It would mark a karmic judgement on the actions of the person and this judgement would be given with great finality. If we look at Voldemort’s transits we can see the final judgement. The first book, Harry Potter and the Philosopher’s Stone was published in 1997, this marked the return of the Dark Lord and Pluto was conjunct Voldemort’s Moon / Saturn that year. The final word came with the last film, Harry Potter and the Deathly Hallows Part 2, with the final denouement in the Battle of Hogwarts and death of Lord Voldemort. The film was released in 2011 when Pluto was conjunct Voldemort’s Sun. Thanks Karina. I agree Capricorns are super nice people, but one thing’s for sure – we don’t like Leos. CS Lewis based his seven books in the Narnia stories, on the seven traditional planets. He kept it a secret hoping someone would one day out him! Michael Ward a theologian sussed it out and has written two books on the subject. “The Narnia Code” The secret of the seven heavens and “Planet Narnia” The sevens heavens in the imagination of CS Lewis.